Turn Up the Radio Loud! The physics of sound projection dictate that any given increase in the size of a hall requires an exponential rate of increase in equipment capability to reach everyone in the hall with quality-at-volume. By the nature of the beast, the energies of over a hundred directly enter our endeavour. Urobouros turns his circles. St. Dilbert is a bombast. Let’s surface the moon with an electrostatic spherical tidal spatial counter-entropic sound system. Energy spoken here. On earth, our overhead expense is $100,000 a month. In 1972 we grossed $1,424,543. Here’s who ate the pie: 70% of this income came from gigs, and 30% from record royalties. Gigs offer the only means to earn more money when it is needed to maintain our operation in all its particulars. We cannot sell more records at will, but we can go on the road, within the limits of energy: so that we must play larger halls, with more equipment, and a bigger organization, requiring more gigs…..
St. Dilbert calls this fellow ‘Urobouros’, and he’s a good trip, but he has a mind of his own:We like a variety of concert situations. Ambiance comes in different sizes. We like a small hall, and so do you, and an outdoor gig in the sun, and a large hall when it can be made to sound good; few halls over 6000 capacity aren’t sports arenas with novel acoustic and environmental puzzles. 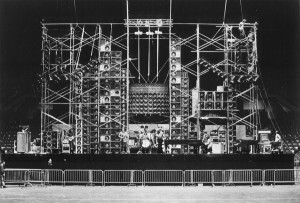 The Wall of Sound acted as its own monitor system, and it was therefore assembled behind the band so the members could hear exactly what their audience was hearing. Because of this, Stanley and Alembic designed a special microphone system to prevent feedback. This placed matched pairs of condenser microphones spaced 60 mm apart and run out of phase. The vocalist sang into the top microphone, and the lower mic picked up whatever other sound was present in the stage environment. The signals were added together, the sound that was common to both mics (the sound from the Wall) was cancelled, and only the vocals were amplified.